We dog owners are a strange breed. We obsess about the day-to-day comfort, happiness, and health of our pets. We own multiple pet beds so Fido always has a soft place to relax; we’re always trying to find him the perfect toy; and some of us even make sure Fido adheres to a doggy diet not unlike a human being’s gluten-free regimen. But since dogs are purportedly man’s best friend, shouldn’t we treat them as we ourselves would like to be treated? It’s no wonder that our mania extends to creating standalone shelters devoted to our canines. I myself constructed an indoor doggie teepee with fallen tree branches connected by sisal twine. Cotton muslin fabric forms the ‘walls’, while a couple of burlap coffee bags stuffed with pillows (and topped by a flokati rug) make up the interior bed. Though a bit wary at first, my dog has succumbed to the comfort of the teepee and sleeps inside each night. 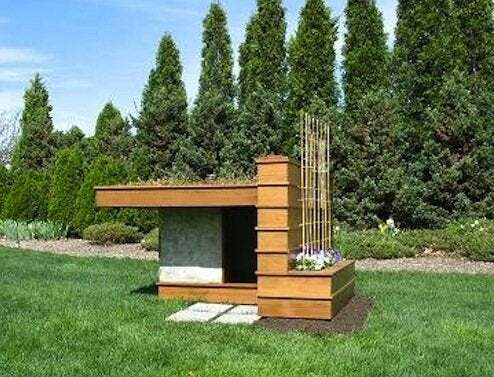 It’s nice to see doghouse offerings are available in a multitude of architectural styles—your house and theirs can seamlessly mesh! 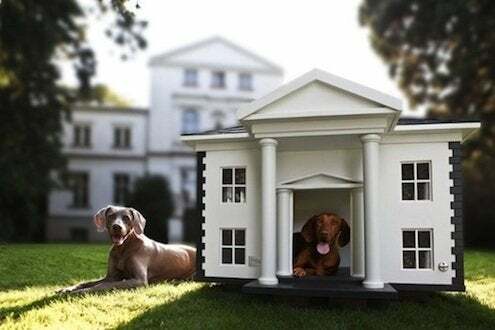 To browse homes-in-miniature for your pooch, don’t miss 10 Luxurious Doghouses for Your Pampered Pet.